Image of Painting of John Norton (Teyoninhokarawen), portrait probably painted by Solomon Williams around 1804. 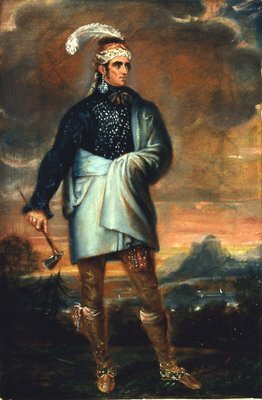 The combination of Iroquois and Mohawk clothing worn by Norton in this portrait reflects both his own dual heritage and the ongoing cultural exchange between First Peoples and Europeans. This portrait was painted in England in 1804-1805.